Kim Durlacher (BScOT, CHT) and her colleagues at the British Columbia Children’s Hospital in Vancouver developed a special orthosis for babies born with brachial plexus injuries. The Sup- ER orthosis, described in the Journal of Hand Therapy in 2014, helps maintain the affected arm in supination (Sup-) and external rotation (ER) during nap time and sleeping. This specific positioning helps to lengthen the tight musculature of the external rotators and forearm supinators, and maintains maximal congruity of the shoulder glenohumeral joint while awaiting for nerve recovery and active movement to return. A recommended wearing schedule is included in the full article. On my visit to the Miami Children’s Hospital, I met with Yvette Elias, OTR/ CHT, who also uses this Sup-ER orthosis with her brachial plexus patients. 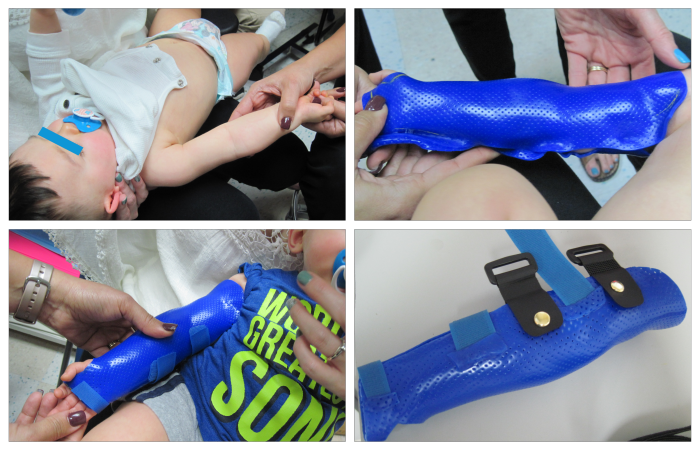 I had the opportunity to help fabricate the total arm piece using Orfit Colors NS 1/12” (2.0 mm) on an adorable 5 month old! The original description of this orthosis calls for a volar based full arm orthosis, but I thought it might be easier for the parent to don and doff a circumferential version on their child. The thermoplastic orthosis is attached via the D-ring straps to a fabric based waistband that fits over the diaper. We’ll get an update from the mother soon on the ease of use of this circumferential variation! Physical Rehabilitation Product and Educational Specialist at Orfit Industries America. Debby is a hand therapist with over 33 years of clinical experience. She completed her Doctorate of Occupational Therapy at Rocky Mountain University of Health Professions in 2010. She is also an adjunct professor at the Occupational Therapy department of Touro College in NYC and has written many articles for hand therapy journals, including the ASHT Times and the Journal of Hand Therapy.